We just had Canada Day last week. It was a pretty soggy one this year but usually the day is celebrated with picnics, bbqs and fireworks. Like Americans, we celebrate our country's birth by "blowing up a small part of it." Although people around here like fireworks even more on Halloween. The air is blue from gunpowder on that night. On Canada Day, we become very patriotic and cover everything in red, white and maple leaves. I'm particularly fond of temporary tattoos. Anyway, Canada Day celebrates Confederation, when Upper and Lower Canada joined the Maritimes to become Canada. Later the other provinces and territories joined this union. Unlike the US, there was no revolution (a few revolts here and there), mostly it was a bunch of guys lobbying the Queen for independence. I guess the squeaky wheel gets the grease because on July 1, 1867, we became The Dominion of Canada (Canada Day was originally called Dominion Day). As for books, I know Pierre Berton wrote tons of books on Canadian history. I haven't read any yet but I hear they are very accessible. An idealized look at Canadian life at the end of the 1800's would be the works of L.M. Montgomery, like Anne of Green Gables. 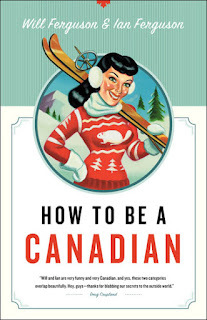 For a humourous look at Canadian life, there is How to be a Canadian: Even If You Already Are One by Will & Ian Ferguson. Thanks for sharing a bit about Canada Day. I always enjoy getting a few fun facts. I have the Ferguson bros. book, but it has a different cover. I'll have to go check it out again. I have read the Ferguson book. Very fun! I have also read Berton and Montgomery, so I agree with the recommendations! I have a cute little book on the shelf: So, You Want to be Canadian: All about the most fascinating people in the world and the magical place they call home. Too much fun. My mom and brother just headed up to Toronto for a few days and I'm steaming with jealousy. Hi all! I'm closing comments on this post because some idiot keeps trying to spam this one post with Chinese characters. Every Freaking Day!